The agapanthus derives its name from two Greek words: agape, which means love; and anthos, which means flower. Together, the agapanthus is the flower of love. In the traditional language of flowers it meant ‘love letter’. 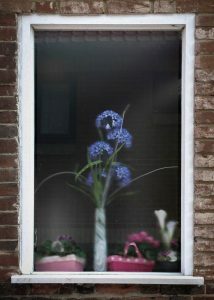 Maybe this flower suggests there is love on offer behind the misted window. But take care. The Greco-Christian agape refers the highest form of love, the selfless, sacrificial, unconditional love that transcends and persists regardless of circumstance. It is not to be confused with eros, nor should this agapanthus be confused with a red light.